Back-to-School shopping was always a favorite of mine growing up. But I wasn't thrilled with the clothing part of the shopping. For me, it was the paper, the notebooks, the Trapper Keeper, the pens, the pencils and the folders. I spent a few years on the low end of the income spectrum and know how hard it can be to buy all the materials for the new school year. With programs like Adopt-A-Classroom, those of us with a little extra money can help out our schools and our youth by donating. What makes it even better is when a company like Elmer's makes it easy for those of us without the extra money to do something! I'm handing a virtual bag of school supplies to Christine G. because I'm certain she'll Bag-It-Forward. Thanks, Stacy, for bringing this program to my attention so that I could Bag-It-Forward! Elmer’s will donate up to $10,000 to Adopt-A-Classroom with your participation. Join now! The Elmer’s Virtual Bag It Forward is charity blog meme, bloggers are able to raise $10 per blog post for Adopt-A-Classroom by writing a blog post or Facebook note and donating a virtual bag of school supplies . Elmer’s will donate $10 per each post written for Adopt-A-Classroom, up to $10,000. -Copy and paste these rules into your blog post or Facebook note. 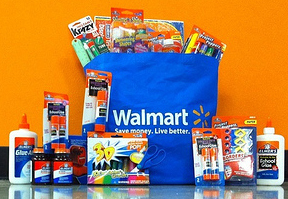 -Create a post giving a “virtual bag of school supplies” to other bloggers or write about your Back to School shopping trip at Walmart. -Link back to the person who gave you a bag of school supplies. -Let each person you are giving a virtual bag of school supplies know you have given them a bag. -Leave your link in the Elmer’s Virtual Bag It Forward comment section. You can also find the official rules of this virtual #bagitforward program there. Elmer’s is donating $10 for each blog participating in the Virtual Bag It Forward Donation to Adopt-A-Classroom (up to total of $10,000 for blog posts written by September 10,2010). Please note that only one blog post per blog url will count towards the donation.